Word of the Day: TROUW, loyalty – Welcome to the Direct Dutch institute, The Hague. Unlike ‘love’, which is a feel-good word, tasting like honey, TROUW (loyalty, fidelity, faith, faithfulness, truth) is bitter and swollen with moral dignity and robust reverence. No. I don’t like TROUW, and you, what about you? I try to avoid using it because I know that its sounds make me feel heavy, fat and full of responsibility. I much prefer ethereal LIEFDE (love) which makes me smile when it is floating around intangibly in some distant paradise. Once you’ve touched LIEFDE and made it a fact of your life by pledging loyalty, you’re tied to this person, principle, cause, idea, etcetera forever. And woe is you when you break the seals and burst the chains and show yourself to be ONTROUW. TROUW and its inseparable counterpart ONTROUW rule one’s life from the twin thrones of the hell of here and now and that’s why they rhyme with ROUW (grief). A human being is fickle in nature and badly equipped for TROUW. Lots of stories in literature and beyond, deal with this phenomenon. We love reading about someone’s ‘infidelity’, don’t we? They remind us how little control we have of our lives. Dogs’ brains are much better fitted for TROUW. Buffy, our ancient office dog, is so TROUW to her mistress Avril that it brings tears to our eyes. Other dogs can have this effect too. 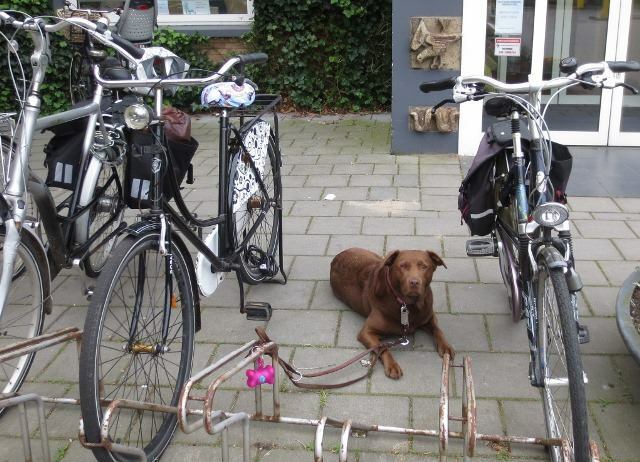 This morning when I visited the huisarts (GP) in Rijswijk I saw this loyal dog waiting patiently for its mistress in a lonely place between inanimate bicycles. When I took my camera out a young woman ran outside to enquire what motives I had.. I answered that I had no particular aim in mind. Except that I was in awe of the animal’s unconditional trust in humans. Trust? No, LIEFDE. LIEFDE? No, TROUW. So I decided to make TROUW my Word of the Day and the following days of the week I’ll explore related words. At first sight the words (Dutch) TROUW, (English) ‘true’ and (German) ‘treu’ must be related in form and in meaning. What satisfaction to find that this intuitive observation proves to be true on closer inspection. All these words go back to the same Germanic root: ‘treuwa’ or ‘trūwō’. In Old English it was ‘trēowe’ and in Old Dutch ‘triuwa’. In those early days of the Middle Ages the word TROUW was loaded with feelings of loyalty and sealed with solemn promises and pledges. ‘To plight one’s troth’ was a pledge of one’s faith and could specifically mean ‘to engage oneself to marry’. In Dutch the verb ‘trouwen’ (marry, wed) reminds us that it is directly derived from this pledge. Until recently ‘trouwen’ was not an act of love. No, it was an act of ‘faith’. An act of TROUW. Fidelity not only tied two partners together but also two families and sometimes even two nations. Tomorrow I’ll return to TROUW and truth (waarheid).